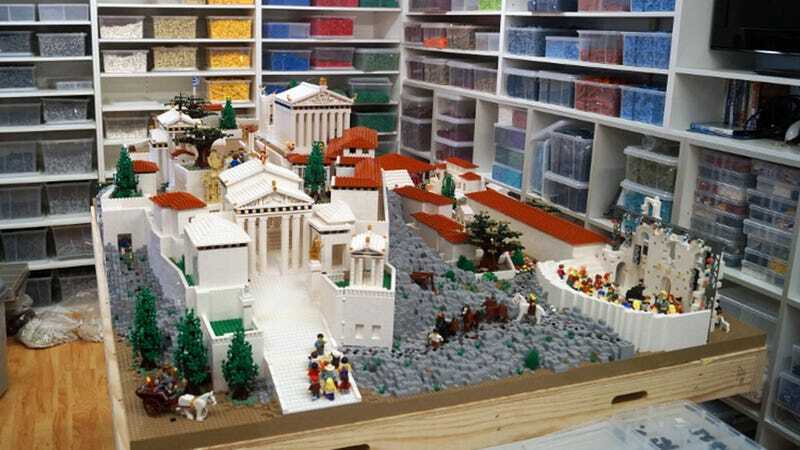 Over 300 hours of hard work went into creating this Lego Acropolis. Starting tomorrow, builder Ryan McNaught—AKA TheBrickMan—will be displaying his creation at Sydney's Nicholson Museum. The classical build comes complete with a minifig Oedipus stabbing his eyes out, with blood spilling over the stage. The Nicholson Museum, in Sydney University's quadrangle, is Australia's largest museum of antiquities and fast developing a reputation as one of the most innovative museums of its type for its integration of the ancient and contemporary world. Last year, more than 90,000 visitors viewed the Lego Colosseum, an increase of 25,000 people on the previous 12 months. Next year, the museum is planning a Lego Pompeii. If we can create an extraordinary experience, an enormous LEGO model in a museum of antiquities, then it's likely that they'll never, ever forget it.